Traveling with Thomas Kittrell, Jr. Thanks, Buddy, your help was and is invaluable. Arrived at airport 13th about 3pm, and Samuel Willner was waiting for us at the arrival area just outside of baggage claim. We loaded up and headed to Be'er Sheva where we met Clive for an enjoyable meal and discussions related to our position relative to Edward, Jeff, and Chriss. I explained to Clive that we (DSVLLC) are hopeful that Edward is able to develop funding for a study, and that Clive and Avraham and others should be free to work with them as they have opportunity. Meanwhile we plan to pursue our own study and development of the project via our own plans, and we are open to collaboration with Edward's group if the opportunity arises. Samuel has already stated his interest in leading a study via his relationship with the Arava Institute of Environmental Studies. Clive is supportive of Samuel’s efforts, and will maintain the needed distance to enable Clive to work with Edward if the opportunity arises. Morning of 14th we traveled to Eilat to add Buddy as driver to the rental car. There we meet Jens Kristan Karstensen (Kikkan) from Norway, whose father spent one year in a Nazi labor camp for refusing to teach Nazi propaganda in public school. Kikkan does social work in Norway, in connection with the Church of Norway (http://www.kirkensungdomsprosjekt.no/). He speaks Australian English from one year in New Zealand, and looks and talks quite a bit like "Crocodile Dundee" of movie fame. The word translated “river” in my English translation is translated “double stream” in the Norwegian translation. This is the meaning given by Strong’s concordance. KJV - brook, flood, river, stream, valley. Anyhow, Kikkan had received an idea of a double pipe, carrying sea water inland for desalination in Namibia, Africa, because sea water would not be subject to theft as would desalinated water. In third world cultures, boring a hole into the pipeline and pilfering water is a well developed concept, as I have witnessed in Mumbai, India. So the sea water would be useless, and not subject to diversion by devious means on the trip inland. At each inland desalination station, brine would be put into a second pipeline, which would carry the desalination brine to an evaporation pond where the brine would be evaporated and harvested as sea salt. The double pipe idea clicked with me, as I have for a long time considered desalination at the storage reservoir, Lake Shalom, and transport of the brine through a pipeline inside the tunnel for injection into the Dead Sea, joining the desalination brine from the Dead Sea desalination plant. Without being too technical, the brine from a desalination plant on Lake Shalom would be joined with the brine from the Dead Sea plant just ahead of the energy recovery turbine, thus increasing the power available to the Dead Sea desalination plant, which will run on energy recovered from the high pressure brine. This brine would be injected into the saline gradient layer between the Dead Sea water below and the Med Sea water above. This meeting with Kikkan was very providential, as he told me in his first email he was in Eilat, and continuing to Jerusalem. When I informed him that we were coming to Eilat morning of 14th, he changed his travel plans in order to meet us that morning, and then decided to stay at the Little House at Bakah during his stay in Jerusalem. He attended our dinner with Rafi Benevisa (more later). His flight home was at 05:00 the 19th, and ours at 00:05 the 19th. I had arranged a row of chairs to lie down, was napping, and waking up I looked nearby, and though I recognized someone. It was Kikkan, seated nearby, and he seemed surprised when I hailed him. You are welcome to figure the odds of all these events happening by chance. The tour of the orchard at Ketura was outstanding. Dr. Elaine Solowey, who is currently working on the domestication of rare medicinal plants for the Natural Medicines Unit of Hadassah Hospital in Jerusalem, is a perfect host, and autographed for us a copy of her "Supping At God's Table" handbook for Domestication of Wild Trees for Food and Fodder. As she went through the orchard describing the various uses of medicinal plants, I was reminded of the closing words of Ezekiel's vision, "the leaves will be for healing." Elaine is an expert on water use of plants in the Arava, utilizing drip irrigation, and she has agreed to prepare a study of water use and potential income from various perennial plants that can be grown in the Arava. We should focus on perennial plants for water use in the Arava because they store carbon in the wood and roots. Her study will be included in the project study that Samuel is preparing to advance. While at Ketura we met with the finance director for AIES. He has suggested to Samuel that the attorney who handles legal affairs for AIES will help Samuel register a company in Israel, Willner Company Ltd, that will be responsible for financial arrangements for the study of the project that will be conducted in co-operation between DSVLLC, Willner Company Ltd, and AIES. William Weisinger of Capital Nature gave us an overview of the solar power work at AIES. Two things stand out, 1. The feed in tariff for the most recent contracts for delivery of solar power into the grid is about $.32 per kwh, or $320 per mwhr. 2. Solar power is shifting to concentrated photo voltaic, using mirrors to focus light onto special high output pv material. 15th we drove north from Ketura up the Arava, stopping at En Gedi for Buddy to take a dip in the Dead Sea. I was amazed to see the Arava spread out as we crossed the ridge between the Red Sea and the Dead Sea. From the Red Sea up to this ridge the Arava is rather narrow, but here it spread out as far as eye could see. Finally I saw with my own eyes what I had viewed on Google Earth many times. This is where two billion cubic meters of desalinated water can be used to grow hundreds of square kilometers of high yielding fruit, nut, and medicinal trees and shrubs. Other potential developments of this area flood the mind. But some areas must be preserved as desert reserves, for the wildlife, and for the contrast between what is there now, and what will be. We checked in at the Little House at Bakah, recommended by Samuel, and I recommend this place to anyone who enjoys guest house style accommodations. It is great. They also have a very good restaurant. We found this out later. 15th at 07:00 we walked for some distance to find a fine restaurant recommended by Rafi Benvenisti. I had invited Rafi to dinner to get his view of the present situation with the Red Dead, and to see if I could convince him that now is the time for the Med Dead. We started off with a typical exchange between Rafi and myself, then we declared a truce, and proceeded with civil conversation. Rafi and I had blogged regarding the relative merits of each project many years ago, and nothing had changed, except that Rafi realized that his dreams for the Red Dead are fading. Interestingly, the subject of Shimon Peres having contacted the Norwegian Pension Fund for funding of the Red Dead came up in the conversation. This was the high point of the conversation, as Kikkan has good connections to people close to the fund. The Norwegian Pension Fund has more than $500 billion, and has a special focus on green projects and projects that are helpful for encouraging peace, a perfect fit. We discussed the need to develop an approach to Peres as one way to approach the Pension Fund, and meanwhile Kikkan will explore his connections. We had been joined for the occasion by Shaul Nahum, who has a background in finance, and who is a member of the Messianic Synagogue where Joseph Shulam is Rabbi (http://www.netivyah.org/). Samuel was very interested in talking with Shaul about Roeh Israel Congregation, and I am taking this opportunity to share this background info with you. Joseph attended our first meeting hosted by Paul Lenga in 2005, and some of you met him then. Interestingly, his work is supported by the Main Street Church of Christ in Murfresboro, TN, and Joseph met his wife at David Lipscomb University in Nashville, where my daughter and three sisters studied. This may be of special interest to General Brady, who has a common faith background with me in a movement which had the good intention to restore first century Christian community, but lacked the Jewish link. Now there is a movement “back to Jerusalem”, which can have a genuine restorative effect. After all, the church began Jewish, and if we are to “go back to the beginning”, we must connect with our Jewish heritage. The context of the scriptures is Jewish, therefore understanding of New Testament scripture is enabled by the understanding of the Jewish culture of the first century. And Old Testament scriptures establish much of the context of the Messiah. Interestingly, Joseph is very much involved in encouraging Messianic Jews to move to Israel, and shares our vision of settlement of the Arava and Negev with believer settlements of immigrants from the communities that Joseph has contacted, along with Jews of many other faiths and backgrounds who will be encouraged by KKL-JNF and others to settle the Arava. 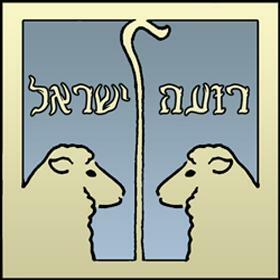 Roeh Israel, "Shepherd of Israel," is a Messianic Jewish Congregation in Jerusalem. We call ourselves “Messianic” because we are followers of Yeshua who accept Him as Messiah. By “Jewish” we mean that the congregation follows the cultural pattern preserved in the Synagogue over the generations by the providence of God, and its normal outreach is to the Jewish community. The original idea of the congregation was to return to the pattern of the community of believers in Yeshua in the first century. That congregation was composed of Jews who were diligent in their observance of the Torah, who lived as an integral part of the Jewish community, and who believed in Yeshua as Messiah. The pattern in the early community was that of cultural pluralism - Jews who remained Jews and non-Jews who remained non-Jews who worshiped the Lord together. The doctrinal position of the Congregation is that the inspired Scriptures are the final and ultimate authority for life and faith in the congregation. Much of Jewish tradition and Halachah are observed, insofar as it does not contradict the written Word. The various creeds of the Church are not regarded as binding on us but rather the written Word of God as understood in its original context. The Shabbat service of the congregation is composed entirely of the Shabbat morning synagogue prayers (Shacharit HaShabbat). These are read directly from an ordinary Orthodox Jewish siddur (prayer book). The prayers and psalms are read at an ordinary pace without the pressure to finish all that is included in the prayer book. Many of the prayers and psalms are sung and led by the Cantor of the congregation. The weekly Torah portion is read from one of the congregation’s Torah Scrolls, and we have several Aliot (call ups), in which each person recites the regular blessings before and after the Torah reading. We normally also read a selected portion from the Prophets and the New Testament. After the Torah reading, there is a brief sermon, which is usually based on the Torah portion for that week. Samuel Willner is very interested in the Torah observant congregation, as he and his parents are believers in Yeshua as Messiah. Perhaps he will find time to come up to Jersualem for Shabbat services. Joseph Shulam was in South Korea, so I was unable to introduce Samuel to him. But Shaul Nahum shared information about the congregation. 16th morning we rode down to Tel Aviv for WATEC, Samuel driving, and Shaul Nahum along with Buddy and me. We visited various exhibits, and made a point of visiting and talking with Mekorot, IDE Tech, and TAHAL. There was genuine interest in the project at each place, but TAHAL showed the most interest. TAHAL has been difficult to connect with the Med-Dead approach because of their involvement in studies of the Red-Dead, but now they seem to realize that the Red-Dead is dead for practical purposes, and that there is a real possibility for Med-Dead. For a long time I have known that TAHAL may be a key player in any development of a project company, and we are beginning our relationship by involving them in the study being conducted at AIES. Samuel will be following up with them for verification of certain technical and economic issues of the project. I am also approaching them for potential development of the desalination tower design. In our conversation, I found out that TAHAL is now in competition with IDE Tech in desalination projects. We had lunch with Paul Lenga, and discussed potential for development of the project through license agreement with the Israeli Government. This approach avoids a tender for the project by the Israeli Government, but will require special legislation to enable the provision of permissions and rights of way for the project. While there is no guarantee this approach will work, it has real potential, and provides a focus for moving forward. At least we would be positioned with a consortium ready to bid the project if the government decides on issuing a tender. Paul has graciously agreed to research and advise our approach in conjunction with Samuel’s study at AIES, and this is his area of specialty, finance and organization of large infrastructure projects. Thanks, Paul, for your continuing friendship and gracious support for the project. We had brief meetings with Avraham Israeli and Harold Wiener. We will continue our friendship with them, but do not see any need for their involvement in the AIES study at this time. 17th had been reserved for meetings, and in particular meeting with Dr. Malik Al-Jaber, which was scheduled for afternoon at 15:00 at the American Colony Hotel in Jerusalem. At the last moment, Malik had to change his schedule and did not cross over into Israel. He invited me to meet him at Dead Sea Resort in Jordan on 18th, but I decided against it because of what would be involved in my going to Jordan on such short notice. I would have to change my flight schedule, which would have been very expensive, and I wanted to go home. Malik was very cordial and apologetic for our not being able to meet, and promised to meet with us when he comes to USA early next year. I have connected him with Samuel to advise studies related to Jordan and Palestinian involvement in the Dead Sea Power and Water Study. Buddy and I enjoyed touring the Old City, complete with a trip down to the city of David, pool of Siloam, Hezekiah’s tunnel, and a parking ticket because I suggested to Buddy that he turn the parking permit upside down in case we exceeded the time. We were ticketed within the paid for time. Thanks for the reminder to avoid devious schemes. The project plans must be ethical, transparent, and full of good will. Samuel, we were advised that we could show the parking permit and the ticket when we turned in the car, and this would be reconciled. It turned out we should have settled this in Jerusalem. If you have any repercussions from this, please inform and we will pay the cost. We paid the car rental cost when we checked the car in at Ben Gurion. 18th we traveled to Haifa and Mount Carmel, driving through the tunnel bored by TBM, similar in size to the proposed Med-Dead tunnel. We made the mistake of trying to find our way to Galilee from the top of Mount Carmel, and found that none of the gas stations had maps, and the attendant’s minds shut down when they heard my Alabama accent. They did not know anything about the Sea of Galilee, and could not understand my pronunciation of Lake Kinneret. Of course I knew that it was only a short distance to Galilee, but was not sure about where the Palestinian territories began in that area around Nazareth. And it was raining, so we turned back to Caesarea. Nazareth and the Sea of Galilee will wait until next time. Apostle Paul was imprisoned here in the Praetorium of Herod, a very comfortable arrangement. This is how Luke recounts the events in the history of the Apostles. Acts 23:32-35--2 But the next day, leaving the horsemen to go on with him, they returned to the barracks. 33 When these had come to Caesarea and delivered the letter to the governor, they also presented Paul to him. 34 When he had read it, he asked from what province he was, and when he learned that he was from Cilicia, 35 he said, "I will give you a hearing after your accusers arrive also," giving orders for him to be kept in Herod's Praetorium. Acts 24:10-25, Paul’s defense:10 "Knowing that for many years you have been a judge to this nation, I cheerfully make my defense, 11 since you can take note of the fact that no more than twelve days ago I went up to Jerusalem to worship. 12 "Neither in the temple, nor in the synagogues, nor in the city itself did they find me carrying on a discussion with anyone or causing a riot. 13 "Nor can they prove to you the charges of which they now accuse me. 14 "But this I admit to you, that according to the Way which they call a sect I do serve the God of our fathers, believing everything that is in accordance with the Law and that is written in the Prophets; 15 having a hope in God, which these men cherish themselves, that there shall certainly be a resurrection of both the righteous and the wicked. 16 "In view of this, I also do my best to maintain always a blameless conscience both before God and before men. 17 "Now after several years I came to bring alms to my nation and to present offerings; 18 in which they found me occupied in the temple, having been purified, without any crowd or uproar. But there were some Jews from Asia --19 who ought to have been present before you and to make accusation, if they should have anything against me. 20 "Or else let these men themselves tell what misdeed they found when I stood before the Council, 21 other than for this one statement which I shouted out while standing among them, "For the resurrection of the dead I am on trial before you today.'" 22 But Felix, having a more exact knowledge about the Way, put them off, saying, "When Lysias the commander comes down, I will decide your case." 23 Then he gave orders to the centurion for him to be kept in custody and yet have some freedom, and not to prevent any of his friends from ministering to him. 24 But some days later Felix arrived with Drusilla, his wife who was a Jewess, and sent for Paul and heard him speak about faith in Christ Jesus. 25 But as he was discussing righteousness, self-control and the judgment to come, Felix became frightened and said, "Go away for the present, and when I find time I will summon you." We visited the ruins of the amphitheater where chariot races were held. Also went through the theater which has been restored, and where various events are staged. The ruins of the Crusader City are nearby. The ancient aqueduct built by the Romans is still standing in many places, witness to the engineering genius of the Romans. It was raining, so we did not play golf at the Caesarea Golf Club, reported to be the only golf course in Israel. Maybe we can put one in the Arava. We dined at the 19th Hole, and recommend the food and service. One of the employees who had been there for about two years said that the Baron and Baroness Benjamin Rothschild had not visited since he had been there. Reflecting upon the trip, I feel good about the proposed study at AIES. I am thankful to Clive for his generous hospitality, and continuing interest in the project. I believe that having a study done at AIES will be a big bonus for the project. Many aspects of the study will be taken from the World Bank study, and other parts of the study can be done by volunteers. However, the layering of Med Water over Dead Sea water must be studied, and we presently do not have funding for that. I am preparing a proposal for the study to present to Dead Sea Works and Arab Potash. It will be in their interest to conduct the study, and hopefully we can convince them. Samuel Willner, with his zeal and determination, will be an effective ambassador for the project. His organizational skills will enable putting the project study together in a professional way. I am thankful to him for his moving forward with plans for the project study, and look forward to working with him. He plans to begin the study in Jan, and complete by July or August. I am happy to be home and recovering from jet lag. We had a campfire and roasted hot dogs, and toasted marshmallows, for the grandkids this afternoon.